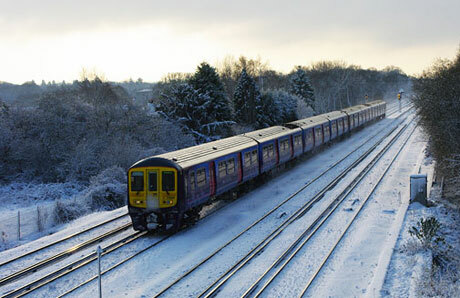 In slippery conditions, such as where snow, ice or leaves are on the line, trains are in danger of skidding along the tracks. This has serious safety implications. It also results in damaged wheels: the area in contact with the track being ground flat. These deformed wheels are expensive to replace. A British train operating company wanted to quickly deal with skid conditions, and needed to know when and where wheels were slipping. They chose Windmill Remote software to do this, as it let them view live data in ordinary web browsers. The Windmill system monitors the wheel-slip-detection mechanism on the train (which is similar to anti-lock brakes in cars). Windmill also reads a GPS receiver: using satellites to pinpoint the location of the slippage. As well as this information - the state of the traction control, braking control wires, wheel speeds, bogie dump valves and time are all recorded and transmitted to an Internet server. Windmill saves data on the server in a series of files; each file holding, say, data from one week or one month. This prevents the data file from becoming too large, and minimises downloading time. When Windmill receives a request from a browser, it presents the data in a series of web pages. Railway engineers can choose to see live information, or historical data and a calendar of wheel slip events. Normal users can only view information. More senior staff, though, can download logged data files, change logging conditions and set new telephone numbers to be dialled in case of alarms. They can import the downloaded data into Excel, or other Windows program, for analysis and report generation. The Windmill system lets the train operating company know immediately where problems are occurring and quickly take remedial action. For more details of Windmill Remote software and monitoring wheel slippage in trains, contact Graham Collins at [email protected]. For information on the software used to collect GPS data, see the COMIML serial driver page.